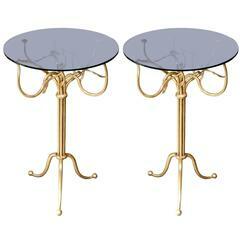 Pair of 'Entretoise' wrought iron and onyx side tables by Design Frères. Great as end tables or as a two-part coffee table. In the style of Mathieu Matégot. Different tops are available (travertine, marble): search for 'Entretoise' inside 1stdibs.\n\nCustom sizes are available: please inquire. 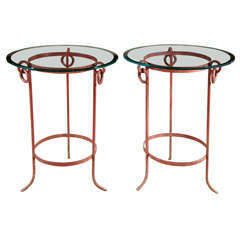 Chic pair of wrought Iron and marble 'Entretoise' side tables by Design Frères. Matte black wrought iron bases with polished white veined marble tops. Pair of 1940s style side tables. Handmade wrought iron side tables, slight variation in size. These are one of a kind artisan made in weathered steel with glass tops. 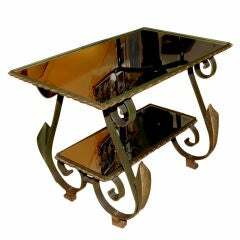 Dimensions: 25” H x 23.5” W x 18” D.
Two tiers wrought iron side table in the style of Gilbert Poillerat.